Business signage is a key element of your marketing strategy. The visual communication that your on-premise business signage provides not only helps grab attention and bring foot traffic, but even facilitates your advertising and branding. Yet, most businesses don’t consider it important to invest in custom exterior signage. But if you knew that every month, almost 85% of your prospective customers pass by your business without noticing it or stopping to contemplate entering just because you don’t have an exterior signage, won’t you do something to tap into this lost business? We bet you sure would. When you are already paying top dollar for your location, it only makes sense to leverage it by getting a custom designed, well-placed business signage that lets you convert your business location into money. For its new office in St. 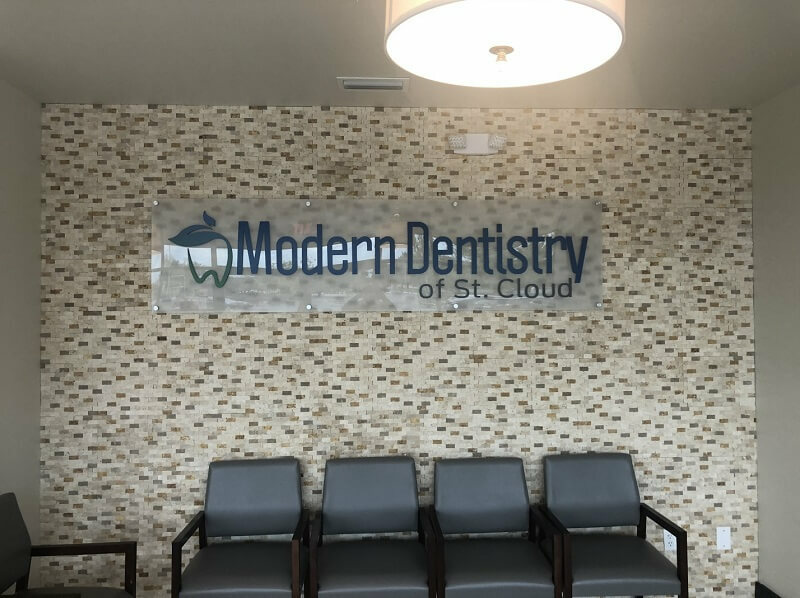 Cloud, Modern Dentistry needed a custom exterior signage to stand out of the crowd by advertising its services well and establishing effective communication with its prospective customers. In addition, they also needed a lobby signage to create a remarkable first impression, establish authority, and strengthen their branding. Citrus Sign Studio stepped into the picture to deliver exactly what they had envisioned. Modern Dentistry is dedicated and committed to improving the health of its patients by bringing high-quality dental care for them. With Dr. Yang Hua – general dentist at the helm, who is assisted by an experienced dental assistant and dental hygienist, along with an office manager, this dental clinic handles everything from general dental problems and dental emergencies, to cosmetic, restorative and pediatric dentistry. 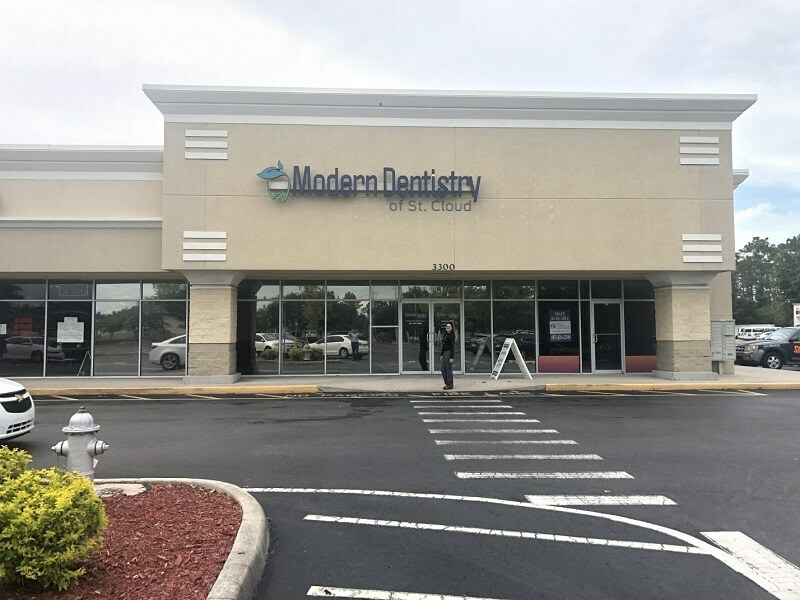 By bringing most of the services that an individual or his/her whole family may need under a single roof, Modern Dentistry makes lives easier and brings back the smiles on patients’ faces. When Modern Dentistry opened the doors of its new clinic at St. Cloud, it needed new business signage to bring in new customers and grab people’s attention, thus getting the ball of its new business rolling. Modern Dentistry already had its logo of a tooth topped by a leaf signaling how the dental clinic was dedicated to ensure its customers’ oral wellness. We decided to use the same for its business signage. 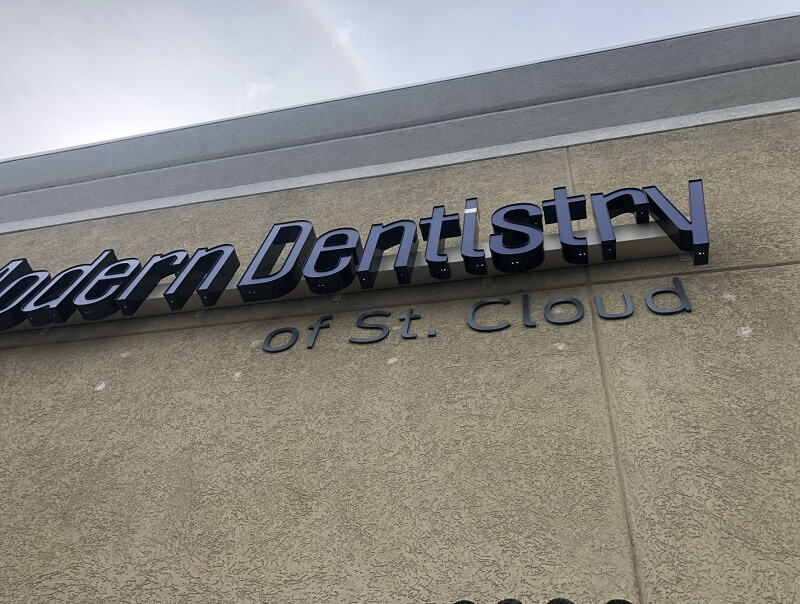 After helping Dr. Yang Hua understand the permitting process and requirements, our team of professionals started work on the massive 20’ x 4’ exterior signage with Modern Dentistry of St. Cloud’s name and logo. We also designed the clinic’s new frosted acrylic lobby signage that was minimal and yet blended aesthetically with the clinic’s interiors. Once both the exterior signage and lobby signage were fabricated, our competent installers stepped in. 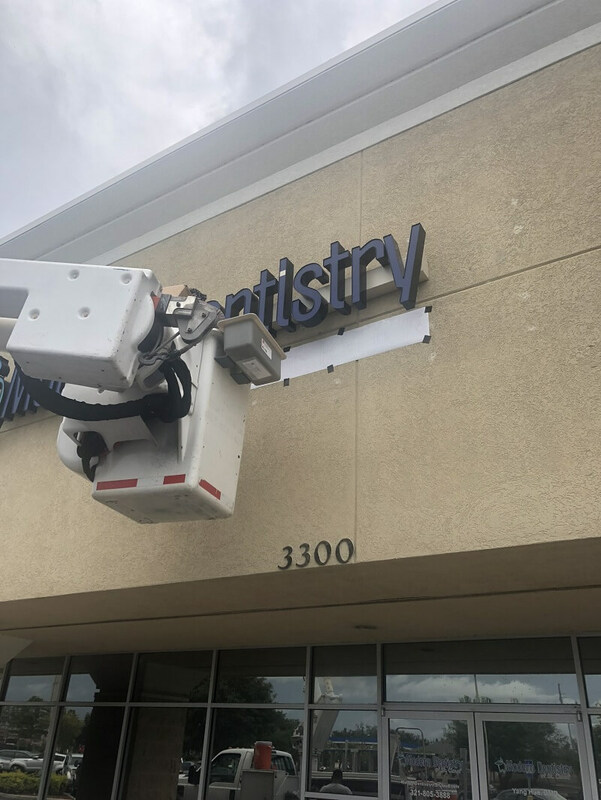 Using modern equipment, they installed both the signs with precision and high-quality workmanship to help get Modern Dentistry’s presence in its new location noticed. Setting up a new office in a new location means the exciting prospect of bringing in new business. With custom new business signage, you can start this journey of growing your business the right way. Just as we have helped Modern Dentistry in its brand new practice opening in St. Cloud with our well-designed exterior signage and lobby signage, we can help you too with your new signage needs.